I finally got around to watching the Dec. 8 Senate Commerce Subcommittee hearing “Data or Dogma? Promoting Open Inquiry over the Magnitude of Human Impact on Earth’s Climate.” Chairman Ted Cruz (R-Texas) spoke with clarity and rigor. Mark Steyn was spellbinding. John Christy’s data were awesome. Nonetheless, as an effort to reframe the public conversation on climate change, the hearing was, all in all, disappointing. One problem is there were four majority witnesses (John Christy, Judith Curry, Will Happer, Mark Steyn) and only one minority witness (David Titley). You might suppose that would give the Republicans an advantage. Not so. Coordinating questions and answers in advance with one witness is easier than with four witnesses. In addition, one witness can more easily reiterate a simple set of talking points. Limiting the expert panel to just one majority and one minority witness would have facilitated genuine debate and non-evadable scrutiny of competing assumptions and data. When former Senator Jim Talent (R-Mo.) was chairman of the House Small Business Committee, he held a pair of hearings during the 105th and 106th Congresses that had only one and two witnesses, respectively. In each hearing he was able to pursue a single line of inquiry from start to finish. The results were spectacular. He thoroughly discredited the Clinton administration’s Kyoto Protocol economic analysis. Another problem hindering Chairman Cruz at the “Data or Dogma” hearing is that all the other Republican senators left after the first round of questions. Result: Titley got more questions than all the majority witnesses combined. He alone had enough time to make, defend, and embellish his case. He also had more opportunities to rebut the other witnesses than they had to rebut him. That allowed Titley to pull some fast ones. For example, Cruz presented a chart of the warming pause based on the Remote Sensing Systems (RSS) satellite record. The pause is very interesting. As you know, Sir, 1998 — big El Niño. So it’s kind of interesting we start at 18 years. We don’t look at a 15-year dataset or a 10-year dataset or a 20-year dataset. We look at 18-year dataset. If you take off that top really big spike [from the 1998 El Niño] and take that out you start getting the upward bias. And this is what people do when you start looking at these relatively arbitrary times. If you start with a really high number at the left hand side that kind of basically influences your linear trend. It is easy to find arbitrary 5-15 year periods when, after careful choosing of the start and stop dates, one can claim there has been no change in global temperatures. The hiatus period of 18 years 9 months is the farthest back one can go in the RSS satellite temperature record and still show a sub-zero trend. 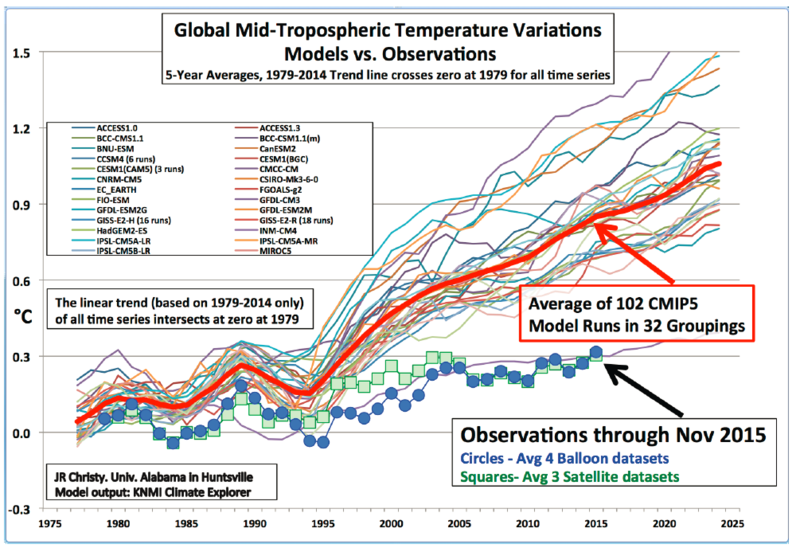 . . .And the graph does not mean there is no such thing as global warming. Going back further shows a small warming rate. Any of the majority witnesses, surely Christy and Curry, could have exposed Titley’s dismissal of the pause as unscientific snark. But again, there were not enough Republicans present to ask for rebuttals. University of Alabama in Huntsville (UAH) atmospheric scientist John Christy explained that in science, the test of whether we understand something is whether we are able to predict its behavior. In stark contrast, the computer simulations underpinning U.S., EU, and U.N. climate policies increasingly fail to hind-cast what has already happened. Models used in the IPCC’s 2013 Fifth Assessment Report (AR5) predict about three times more warming than has actually occurred in bulk atmosphere, the critical weather-formation layer where mankind’s enhancement of the natural greenhouse effect is supposed to be strongest. Let’s talk about the satellite measurements. Let’s talk about orbital decay, let’s talk about overlapping satellite records, let’s talk about stratospheric temperature contamination. I think Dr. Christy and Dr. Spencer when they put this out, they have been wrong at least four consecutive times. Each time the data record has had to be adjusted upward. There have been several sign errors. So . . . with all due respect Sir, I’m not sure which data your staff has. If it’s the first or second or third or fourth correction to Dr. Christy’s data. We used to have a negative trend, then we had no trend, now we begrudgingly have an upward trend. How petty. Of course, Christy and Spencer have corrected their dataset over the years. The first people in the world to develop a satellite-based global temperature record, they had to learn by doing and correct for non-climatic temperature influences discovered by themselves (instrument body bias, diurnal drift bias) and others (orbital decay bias) along the way. 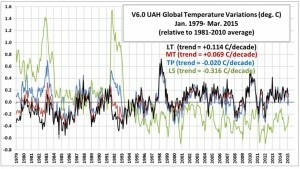 Those improvements are not evidence that the current UAH record is wrong, less accurate than surface station records, or less trustworthy than climate model projections. As noted, the UAH record is consistent with two other satellite records and four weather balloon records. What evidence does Titley have that all seven records are biased in the same way? He did not provide any. He did not even allude to any. One wonders how much Titley actually knows about the UAH record, because he botches a simple factual point. 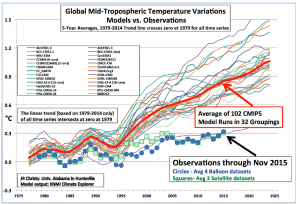 “Each time the data record has had to be adjusted upward.” Not so. Christy and Spencer’s latest version of their record (UAH6.0) is cooler than the previous iteration (UAH5.6). 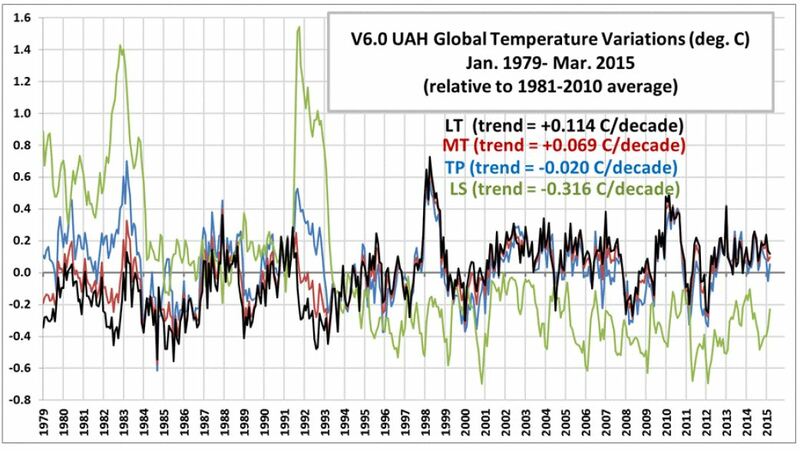 Like the RSS satellite record, UAH6.0 shows no net warming for 18+ years. Perhaps the most disappointing thing about the hearing is that Senators Ed Markey (D-Mass.) and Brian Schatz (D-Hawaii) got away with their usual rhetorical flimflam. 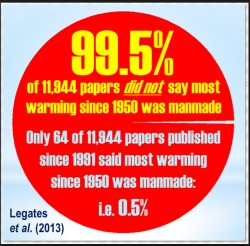 The climate debate is between the 97% of scientists who believe global warming is real and the 3% (supposedly including the majority witnesses) who believe it is a hoax. If global warming is real, then is it inherently dangerous and likely a catastrophe in the making. There is no danger in putting politicians and bureaucrats in charge of planning the world’s energy future, and none in putting an energy-starved planet on an energy diet. The national and global campaign to tax, regulate, and mandate mankind “beyond” fossil fuels is bound to be either an expensive exercise in futility or a humanitarian disaster. You fear fostering climate drama queens and lazy news editors will pay the price in history for needless CO2 panic to our children. After 34 years of climate action failure and global debate, climate scientists are now 99% certain the planet isn’t flat and 99% certain climate change “could” flatten it? Liberalism’s abuse of science is worse than anything Bush ever did. It is revealing that mine is the first comment on this article– or have there been others that have not been published? What is most concerning to me about organizations such as yours that attempt to “debunk” the concerns of the majority of climate scientists, is that you call yourselves conservative. With the knowledge that the CO2 level in the atmosphere has reached 400 ppm, a level not seen since the Pliocene Epoch 3.6 million years ago (when the earth was ice free and the temperatures were 4 to 7.5 degrees F warmer and ocean levels 25 meters higher than today), would it not be conservative to reduce our use of carbon fuels to slow this increase? I would contend that it is a dangerous, radical idea to ignore this evidence and insist that market forces should trump all. Nine days ago I left a comment at this location and see that it has not been published. Why leave this box here for comments if you are not going to use it? Here is my comment once again. Previous post: Is the Paris Climate Agreement a Treaty?